It’s really easy in a corporate career to get lost in the swirl. I did…and to be honest I think I’m just coming out of it. I’ve always strived to hustle and perform my best, but without guidance and direction, I can feel like whatever I’m doing isn’t getting me anywhere (tires spinning in mud is what I’ve been saying to describe what I felt). What I’m reminded is that I’m not in this alone. My brief conversations with my mentor show me that others have experienced this before, and found a path for them, and they could help me find my path. My experiences in my 26 years are valuable lessons for others. I had my first mentor session with a potential mentee, and instantly I became grateful for both the good experiences I’ve had and the bad…they’ve helped me become who I am at work, and at this moment provide insight to help others on their journey. I think this is what I most valuable at this point in my career…to help others succeed…and part of that is to be a mentor to others. I’ve also had meaningful conversations at work this week that are not about technology…they were about personal lives, college journeys for our kids, and more. What I’m reminded is that the more I share and engage with other humans the more that conversation helps both myself and the other person. I become grateful for the things working well in my life, I receive cautionary tales of things that could go sideways in my life in a blink if I don’t continue to put effort into it, and I receive guidance for things I’m struggling with that the other person is succeeding in. Help others succeed – no matter what I do, how many I lead (or if I don’t officially lead anyone), or what projects I’m on, if I can help others succeed, it will add more meaning to my career than anything I succeed at personally. Keep Perspective – Nothing I do in my career will last. Tech companies move so fast that even the most successful product will be replaced, enhanced, modified to the point where my individual contributions will disappear. In the end, at least for me, it’s about relationships, helping others, and working hard. If, once I’ve left, I hear someone say, “Greg? He was a hell-of-a-guy” and says nothing about my technical achievements, that will be enough. When I was 16, I was a drug dealer. Well, that’s what my friends parents assumed since all I talked about was the music gear I kept buying. I believe their comment to my friend was, “how on earth could he have that kind of money while unloading trucks at Dayton’s!?!”. Truth is I just never spent a cent on anything else. If I couldn’t play it or drive it, it never really was of interest to me. I loved buying and talking about gear. “I love my new Oberheim Matrix 6…especially the…”, or, “You’ve GOT to listen to this new patch on my Korg Poly 800″… and on and on. The vibe, sounds, (and smells) of “Knut Koupee”, “Torps” or “The Good Guys” are some of the most fond memories I had growing up. I know. Boring. But it’s true. MIDI – Musical Instrument Digital Interface…an inter-company interface that let one electronic instrument (synth, drum machine, sequencer, …) talk to another, regardless of who built it. For me, a musician, MIDI enabled the ultimate user experience: MIDI lets musician use the tools they want, to create something new and wonderful, without having to adjust their behavior due to greed, or fear, or whatever it is that prevents companies from providing complete interoperability. Further, the musical instrument industry blossomed! Nobody was trying to “build their ecosystem”, or “Capture the market”, they were driven to create amazing instruments to delight their users … they were trying to outpace their competitors not in proprietary environments, but in awesome sounds…awesome experiences. And it was all synched from my click track on my Yamaha MT1X 4-track recorder where my vocals and guitar tracks lived. Just yesterday Amazon and Microsoft announced that “Alexa and Cortana have become friends”. If they really are working for full interoperability, I think this could be the beginning of exponential growth in great experiences. The skeptic in me is wary since they’re currently just passing control to each other based on user commands like “Alexa, open Cortana”… which creates ‘modes’, an awful experience. THAT is a future direction that is truly focused on user experience…and one that could see growth in the industry that would dwarf where it is now. Here’s to the future learning from the past: How a growing industry can achieve UX greatness…delivering outstanding user experiences, interoperability…and here’s to MIDI…the technology EVERYONE should love because it is a shining example of what can happen if we collectively work to delight our users by just making our stuff work together. I just got an email from Caribou Coffee, and unless it starts with BO and ends with GO, I usually quickly delete them. 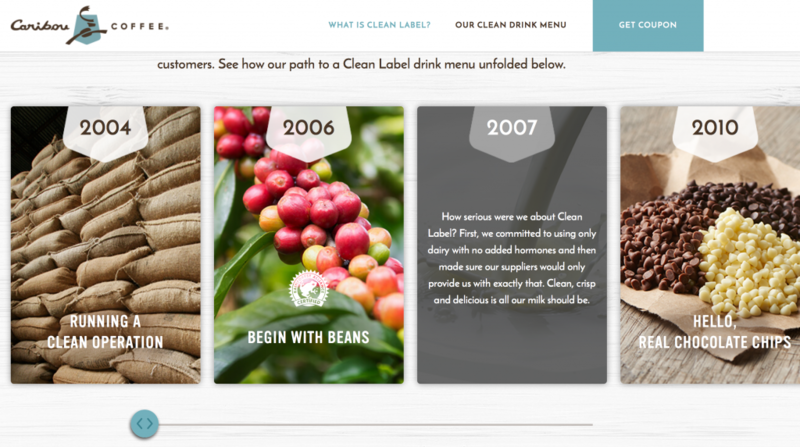 However, something about the “Uncover our Journey” title intrigued me, so I clicked (full disclosure: I’ve love Caribou Coffee ever since my first napkin had the saying, “Rich and Smooth…because Burnt and Bitter was already taken”). What I discovered was an amazing way to communicate integrity, passion, character, deep technical detail, and the ability to execute on a vision through thoughtful design. I think we could all learn from this (especially those of us in technology). The Scroll Bar Reflects Reality…that Their journey is NOT DONE: I love this part. The design shows a scrollbar … nice big fat scrollbar…and look what happens as you scroll right…it stops before the rail ends. Subtly they are showing that the journey isn’t done yet. This was another favorite: “Guess What Might Be Added To Other Coffee” section let the user simply scroll and as a whimsical surprise, a very large technical list of ingredients appears on the right. Now, they could have added it in the main space, but how boring! This was pure design delight. I could see the technical details, and even chuckled when commentary flowed in the list AND the bottom of the page “Almost there…” and so on. Finally when the list is done, some very subtle yet effective animation throws the “Other” cup aside, and makes the Caribou cup glisten…like it won…but also like it sparkles with purity. In the menu section there’s a lot of pretty pictures with big words for the main ingredients. Only the most nerdy would scroll through the end of each ingredient list. If you do, then you’re like me and you’ll be further delighted with a “Detailed Ingredients” list that shows every last detail…and then a Culinary Team Note clarifying that even complicated sounding ingredients can be natural. Well done, Caribou. I love the design…and the honesty. Shows you are a great company that cares about its users. 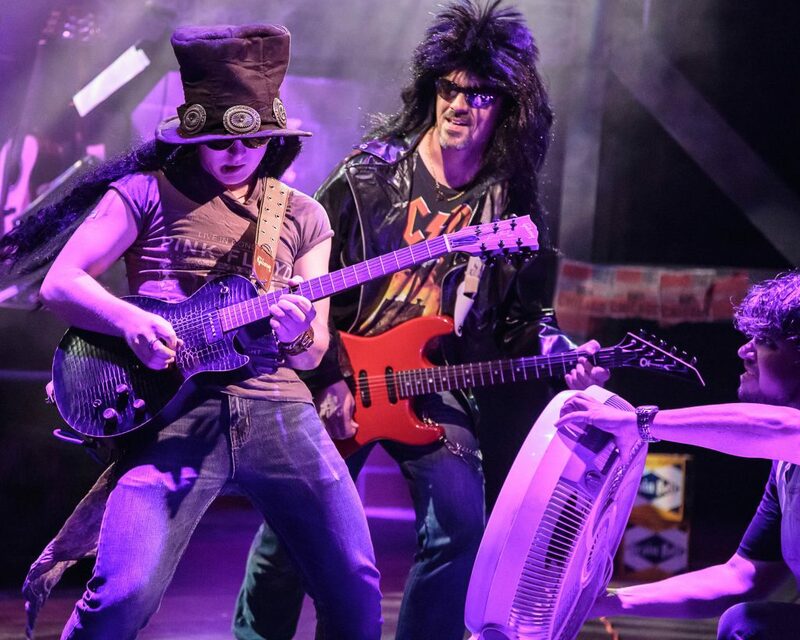 I music directed Rock Of Ages at Rochester Civic Theatre from July-October 2016 (vocal director, music director, led the band during the run). The lead-off song had a ripping guitar solo. This is a picture of the two of us down stage sharing the spotlight, and that exact moment, it was Remi’s turn to shine. What I love about this is my look of joy and delight (with a hint of “Damn, he’s good!”) watching him in the spotlight. Certainly I could have taken all the “fun solos”, but I love to see those I’m leading SHINE…do what they’re great at and watch…and smile. …we are better as a team contributing all our expert skills complimenting each other rather than fighting for the spotlight. I mean, I could have just been focused on my next part, ignoring his contribution…but (at least the photo suggests) I was thoroughly enjoying what this team member was doing and put the spotlight appropriately on him. …the best team starts with preparation. I started in January practicing myself, getting organized, and spent most of the time building the best team possible…members with skills that outshine my own…that compliment each other…where the players are also nice…fun to be around. …a great team truly listens to each other. In this show, there were times we acted as a single organism…completely in synch, and when a glitch happened (vocalist or my miscue) the band didn’t miss a beat…we adjusted and locked in without the audience even noticing….most of the time without even looking at each other…just sensing through a guitar lick, a hand wave, or a drum fill, what the next note should be. …this great team’s suggestions were valued and many times taken. …I know we spent endless hours rehearsing and preparing but LOOK AT YOU!! You are killing it!! …when it came to the performance, they followed my lead. My hope was to gain their trust through rehearsal so that by communicating my vision early, taking and executing their suggestions, that by showtime there was zero hesitation or argument about the real-time directions I gave. The result was hard-hitting, locked-in rock-n-roll that showed not only our individual skills, but showed the elevated “one-ness” of the band in the “this sounds amazing and much more than the sum of its parts” kind of band. Finally, to me, it says, “you are at your best when you focus on helping others succeed, not when you are striving for your own success”. I know, not very ‘career-driven’, but maybe that’s why in IBM-world I am happiest leading a project where the team has a common vision, where the designers and developers looked to me for direction, but (hopefully) know my main purpose is, through delivering an experience customers love, that each designer and developer have a deep ownership that results in a rich sense of satisfaction when their designs and code are the reason that outstanding experience exists in the first place. Come on, you remember. You’re in high school. You are riding on the bus (or the back seat of your friends car), and the vehicle makes a sharp turn. Etiquette says you fight against the G-forces to keep in your space. But sometimes physics takes over and you lean hard into the person next to you. There are all kinds of forces that affect us every day. Most of them we naturally resist…it’s what etiquette suggests. 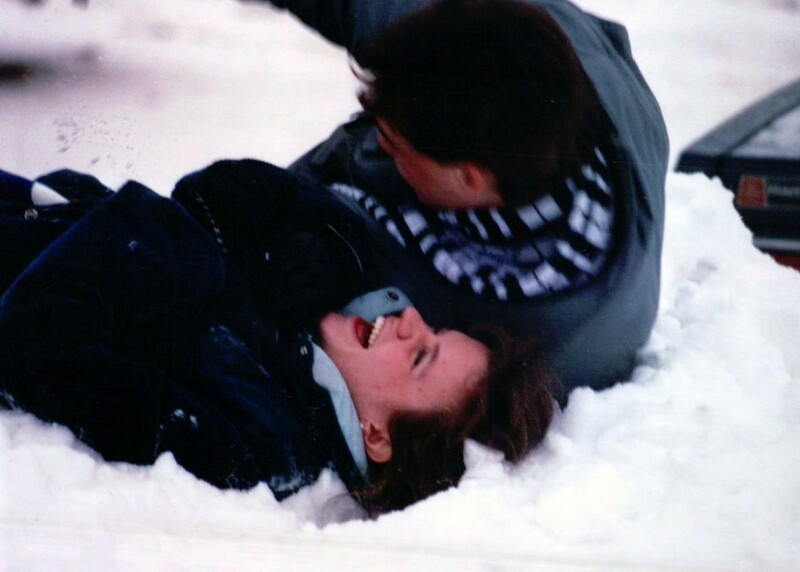 Etiquette says it’s not proper to let that force push you…to be pushed into something you can’t control or foresee. Etiquette says you must always be in control. …but what if etiquette is wrong? What if etiquette is restricting an amazing journey that could be wonderful…life changing…terrifying…and beautiful all at the same time? What if…the force isn’t something pushing against you…what if the force is something pushing for you into a dream-making opportunity that could only happen if a greater-than-you-could-muster-on-your-own force helped make it happen? What if the force is the gentle presence of God guiding you, a divine nudge into your next-best-of-all-possible-multi-verses, and all you have to do is trust that this G-force always has your best interest in mind? What a great way to educate, inspire, and entertain all at the same time. Beethoven #GoogleDoodle. While I’m way into music, I still found myself immersed in this little Google Doodle…enjoying the music, the story, and rooting for a cartoon character I was just introduced to seconds ago. For others not as familiar with his music, they learned that he composed music they recognized but didn’t know who wrote it…and even learned some sheet music structure as well! Through it all, the Google Doodle inspired me by telling a story, complete with showing problems, sadness, and finally, resolution with resounding 9th symphony chorus. Most importantly, it made me want to continue to the end…to learn more, to stay curious for the outcome. Think about it: “Inspired”…”Stay Curious”; quite an accomplishment from a silly little web app. I just gotta wonder how much more our users would get out of our IBM Cloud content if we focused on those two phrases: “Inspire” and “Stay Curious”. What if we were driven to inspire by telling a story, educating with exercises along the way, and use emotion and success to keep users experimenting…to stay curious? What if we made our documentation an actual reason to click to IBM Cloud? What if the experience of our DOCs was so satisfying, so sticky, so valuable, that the natural next step was to actually try the product out? …and what if our DOCs were so intertwined with our product that after our users were educated, entertained, inspired, and guided, only then would they realize that through their curiosity, they’ve been using our product all along? Thanks, Google, for a great lesson. Here’s to creating the best cloud experience imaginable! It was the announcement that IBM Systems Director, the product I spent years working on, was officially being pulled from market. From 2004 through 2012 I spent most of my time at work working with users, designing, leading, educating, writing, and traveling to make IBM Systems Director the best it could be. Not that it shouldn’t be…it’s a product from another era…pre-cloud. It’s purpose was to provide IT administrators a single experience that could manage the whole data center in a company’s shop. Certainly we can talk for hours about to what degree it succeeded doing that. While some may have criticized it, I loved working with a fantastic development team, and I felt like through our work with users and focusing on what they need, we were able to raise it a whole grade (or two) compared to what it could have been. But, in the end, customers, and IBM, moved on. What really messed me up is trying to think of all the personal and family sacrifice I made to make it better, not to mention the hit to the ego. I started to think of the missed family activities, all the effort, all the “we’ll fix it next release”, and it hit home that nothing…especially nothing in the IT world…lasts. Which makes me think: what will last? In a big company like IBM, even the best employee leaves a hole that fills in within a week or two. It reminds me of a Diary Queen shake: A new employee is like taking a spoonful out of a melty shake…the melty ice-cream quickly folds in and within minutes, nobody knows the spoon was even in there. Even a stellar employee is like a spoon getting pulled out of a thick custard shake…it may take a bit longer but soon enough even the biggest hole gets filled in. Actually, a healthy company is designed to do that so productivity isn’t impacted by one person. So what’s left? Relationships. My relationships to my family and friends. Most of my work relationships won’t last…hopefully some will but most are merely acquaintances (who will hopefully one day pause a few minutes before claiming my chair, monitor, and white-board markers). My family relationships are what might last: My wife, my kids. My wife I love dearly, and we are each-other’s anchor. But really the only thing that I am uniquely essential to is my kids. Sure someone else can raise them, but they won’t be their dad. That’s all me. So what do I do with that? In a way it’s invigorating! It helps me focus on what’s actually important. …that they should be driven by their passions and a career can possibly become that passion but will more likely their passion will become a wonderful side-car to their career that will give their life a sparkle. Anyway, I’m still learning and trying to balance how this all works. Maybe I can teach and guide them so it doesn’t take them 23 years of hard work, where 8 of those years were entirely focused on a product that is no longer in the market…just to realize that the product’s purpose for me was to enable a fantastic life…it’s not the source of a fantastic life. My sons are drummers. One is a killer-good drummer who can riff in a drum-line or a kit all day long. The other is just starting out, but already lays down a groove that compels me to pick up a guitar and jam along with him. They just make me want to play with them…because they make me sound better. Well, now I know why. 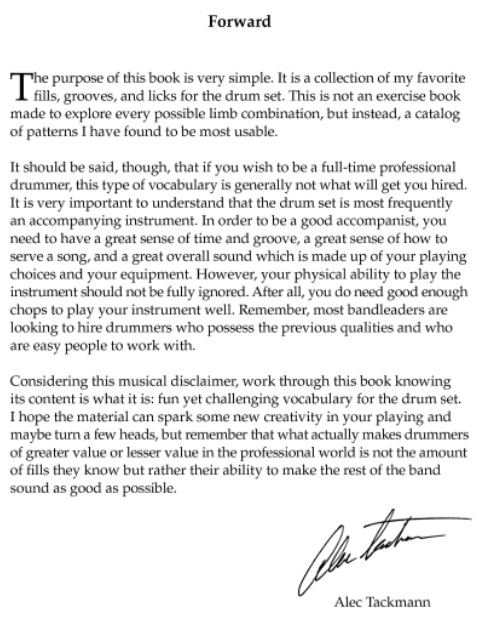 Their teacher just published three drumming books (Get them…you’ll love them). The forward of the third book is so inspiring I think we all could learn from it in how we work with our team at work, how we approach our designs, and ultimately how we can delight our users. Imagine: While a drummer has the ability to be the loudest one in the group, the most impressive (selfish? ), the most showy, what Alec shows is that by serving the band and letting them shine, you will actually be the most valued and sought-out drummer of anyone. What could it be like if we used all our talents and skills solely to make the rest of our ‘band’ sound as good as possible, rather than to make ourselves look good? How motivated would our teams be? How focused would our designs be? How great will our user’s experience be…because we are serving them, not furthering our own agenda/portfolio? Do me a favor: As you read the image below, replace “drummer” with “designer”, “leader”, “general manager”, or heck, even “dad”. After you read it, list below who your ‘band’ is. your family? your team at work? IT administrators? Developers? A youth group? Your users who are skeptical of any software because they’ve been burned in the past? Then, describe what you could do to make the rest of your band sound as good as possible. I love guitar. I love playing it, recording it, composing with it, and reading about it. …and I love how it can apply to design. 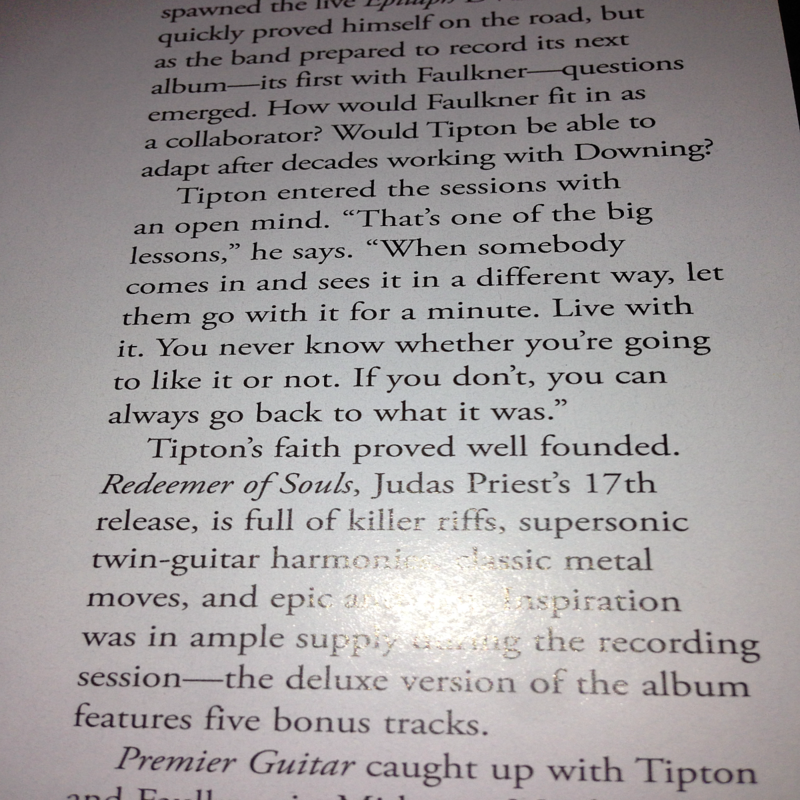 In a recent issue of Premier Guitar magazine, an article on Judas Priest focused on how they’ve thrived over the years and what it was like bringing on a new guitar player after playing with their last one for decades. It’s a great lesson for both new designers coming on board and experienced designers welcoming them. Experienced designers need to embrace change, welcome new ideas, and new directions. Welcome your awesome designers’ ideas, passion, energy and run with them for a while. See how the ideas breathe and interact with your vision. Maybe your vision needs changing. New designers need to understand the story, the history, where the product has been and how its customers interact with it. 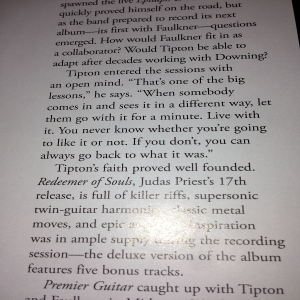 In Judas Priest’s case, they had loyal fans but also wanted new fans. They didn’t want to stay a tired “back in their glory days” band. The combination of new designers paired with experienced designers can produce powerful results through a collaborative exchange of ideas, old and new, that might surprise your customers and make for an even more delightful experience. When we designers at IBM start communicating ideas for a new design, one powerful way is through an analogy. It’s a way to relate a powerful capability and user value of complex enterprise software by associating it with something that everybody 10 years or older can understand. Cupcakes are delicious, beautiful, and everybody likes them. We want our software to be the same! The problem is that your software could be the most functionally rich, best designed, and beautiful UI in the world…but if bad messages appear, it wrecks the whole experience…frustrates your users, and sometimes makes them angry enough to make your users abandon your product. It just happened to me. Recently I watched my son register to automatically submit his transcripts to the university he was applying to. Great! Very useful! Love it! We tried other emails and it worked fine. We copy/pasted and all the other tricks (thinking it had hidden characters somewhere) but no luck. Finally, beyond frustration, we just gave up and contacted the guidance counselor the next day. Days later, we learned that the email was not valid for registration because his school had ALREADY REGISTERED HIM! 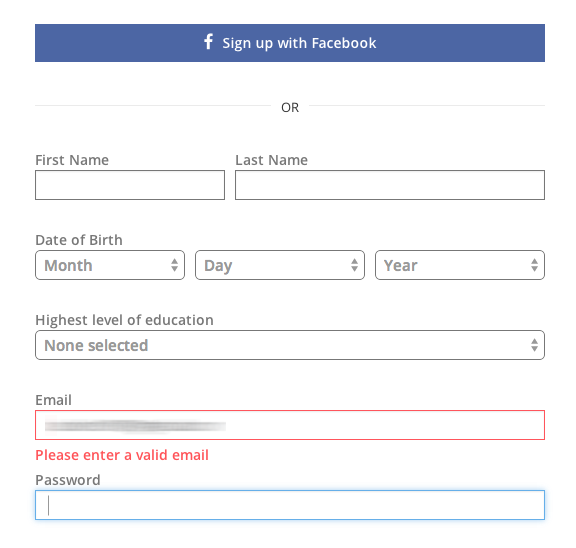 While it’s technically accurate that the email is not valid during registration because the email was already registered, it’s a stupid message! It caused us endless grief and prompted us to use the ‘old fashioned’ way and abandon the software. In the end, a user experience is only as delightful as its weakest message. Designing for error paths and writing great messages is boring. I get that. Most of us leave it to the end. But if we DO focus on messages just as much as the colors and fonts of a product, it could have a far deeper impact for our users. How about you? Have you been delighted by a products messages? Or did you eat dog hair, too? Greg Hintermeister is an inventor, musician, believer, husband, father, parrothead. His designs can be found in many IBM products; his heart can be found wherever his wife is.